The Transiting Exoplanet Survey Satellite, or TESS, is a small mission to be launched aboard a Pegasus XL in 2017. The mission was selected by NASA on April 5, 2013. As seen in the animation posted above, it will provide a two year all-sky survey of exoplanets in our galaxy. The spacecraft will only be able to observe planets around closer and more luminous stars, ones with apparent magnitudes brighter than 12. Unlike the Kepler mission, TESS will not be able to discover small planets (<1 Earth radius) and ones further out, objects that could be located inside the habitable zone of a larger star. Each of its four wide-angle telescopes view 23 by 23 degree portions of the sky, combining to see 90 degree sectors at once, from the celestial equator to a pole. The northern hemisphere will be studied in 13 sectors for 27 days each then TESS will rotate to observe the southern hemisphere for the second year of its mission. The small spacecraft will be placed into a high Earth orbit with an opportunity to transmit data to Earth for three hours every 13 days at perigee. This gives it two chances to downlink data during observations of each of the 26 sectors. The satellite will also aid the future James Webb Space Telescope mission, providing candidates for the infrared observatory to look at in the northern and southern poles where TESS observations overlap for a year each. Last edited by Unstung; 05-05-2013 at 11:36 AM. NASA: "NASA’s TESS Mission Cleared for Next Development Phase"
“During its first two years in orbit, the TESS spacecraft will concentrate its gaze on several hundred thousand specially chosen stars, looking for small dips in their light caused by orbiting planets passing between their host star and us,” said TESS Principal Investigator George Ricker of the Massachusetts Institute of Technology, Cambridge, Massachusetts. During the third year, ground-based astronomical observatories would continue monitoring exoplanets identified earlier by the TESS spacecraft. “After spending the past year building the team and honing the design, it is incredibly exciting to be approved to move forward toward implementing NASA’s newest exoplanet hunting mission,”Volosin said. Last year, the cameras on TESS were determined to have a focus issue. However, NASA eventually determined to launch anyway because it won't have a large enough impact on the mission. In January, NASA certified the Falcon 9 FT to launch medium risk (Category 2) science missions like TESS. Finally, TESS has recently arrived at Kennedy Space Center for a launch no earlier than April 16. Wow, looks like a really interesting mission. Seems not to be getting very much attention, though. I find the "upgrade" from Pegasus XL to Falcon 9 interesting. Did TESS get heavier or Falcon 9 that much cheaper? Last edited by boogabooga; 02-23-2018 at 06:44 AM. 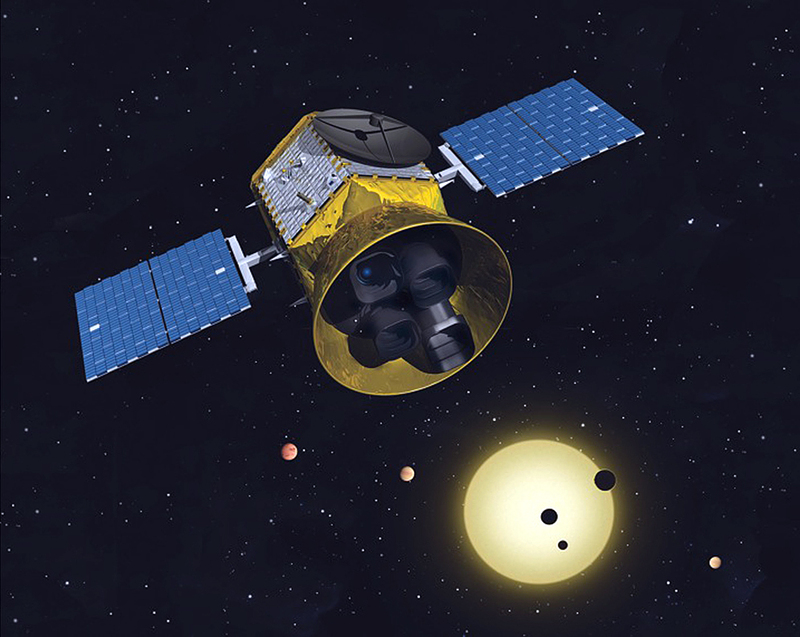 NASA's Transiting Exoplanet Survey Satellite - TESS - will fly in an orbit that completes two circuits around Earth every time the Moon orbits once. This special orbit will allow TESS’s cameras to monitor each patch of sky continuously for nearly a month at a time. To get into this orbit, TESS will make a series of loops culminating in a lunar gravity assist, which will give it the final push it needs. TESS will reach its orbit about 60 days after launch. I have created a few scenarios for this 2:1 P2 lunar resonant orbit in Orbiter. Enjoy! Last edited by Nicholas Kang; 04-10-2018 at 12:03 AM. SpaceX is targeting launch of NASA’s Transiting Exoplanet Survey Satellite (TESS) on Monday, April 16 from Space Launch Complex 40 (SLC-40) at Cape Canaveral Air Force Station, Florida. The 30-second launch window opens at 6:32 p.m. EDT, or 22:32 UTC. TESS will be deployed into a highly elliptical orbit approximately 48 minutes after launch. A 30-second backup launch window opens on Tuesday, April 17 at 6:13 p.m. EDT, or 22:13 UTC. This is an exciting mission. I will stay up for this. The gravity assist has been completed successfully! Next stop, mission orbit.